From Finger Rock Trailhead at the north end of Alvernon Way follow Finger Rock trail northward 1.1 miles to Finger Rock Spring. From here continue northward for 1.9 miles. After crossing some steep slabs near the edge of the cliff, the trail flattens out onto a large, open promontory above the canyon bottom. Here the trail turns eastward. At this point, you will leave the well-traveled trail, and not likely see anyone for the remainder of the hike. Do not follow the trail as it turns east toward Mt. Kimball. 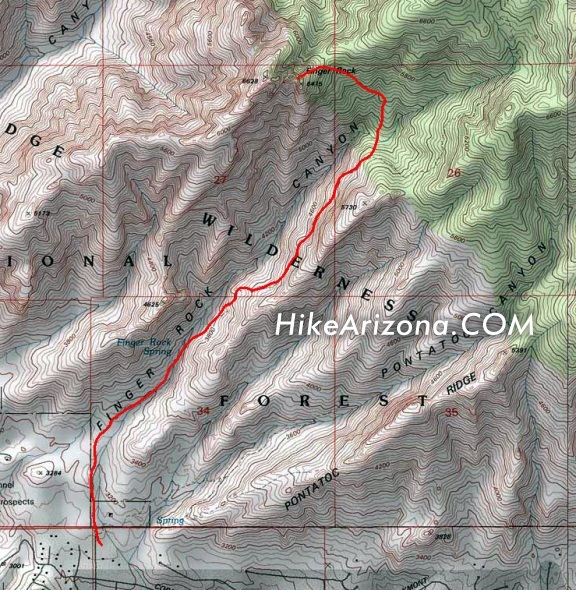 Instead hike northward, down a steep, obscure path and across the wash below. This wash bottom is a nice shady place to rest before the final push that lies ahead, especially if water is running. A faint, increasingly steep route marked by cairns (hopefully) will contour to the north back uphill and eventually around the back side of Finger Rock Guard, the large formation immediately east of Finger Rock. As you approach the formations proper, the trail splits, up and left to the Guard, and down and right to the Finger. Follow the left trail up over a short blocky wall. Some technical scrambling will take you through a short labyrinth of rock formations, and eventually out onto the summit of Finger Rock Guard. Technical gear is not required to reach this summit. Take the steep right trail, first downhill and then up, ten minutes through dense vegetation until it dead ends at the northwest face of Finger Rock. The views from the saddle below Finger Rock itself are spectacular. The exposure is extreme. The true summit of Finger Rock is a technical climb, details at Finger Rock Summit. Allow at least three hours for the approach, and a little less for the return. This hike is difficult, steep, and loose in many places. Not for the faint of heart. Plan on a full day of hard work. Finger Rock Trailhead is a large signed trailhead in the Foothills of North Tucson. There is a County Parks Parking Lot here open daylight hours. A permit is required for overnight parking. From Tucson, take First Avenue North to Sunrise. East on Sunrise to Skyline. East on Skyline to Alvernon Way. Drive to North end of Alvernon Way. The parking lot is on the left just before the road curves.